How often do you think about listening? Most of our day is filled with some type of communication, but are you taking the time to listen–to listen well? 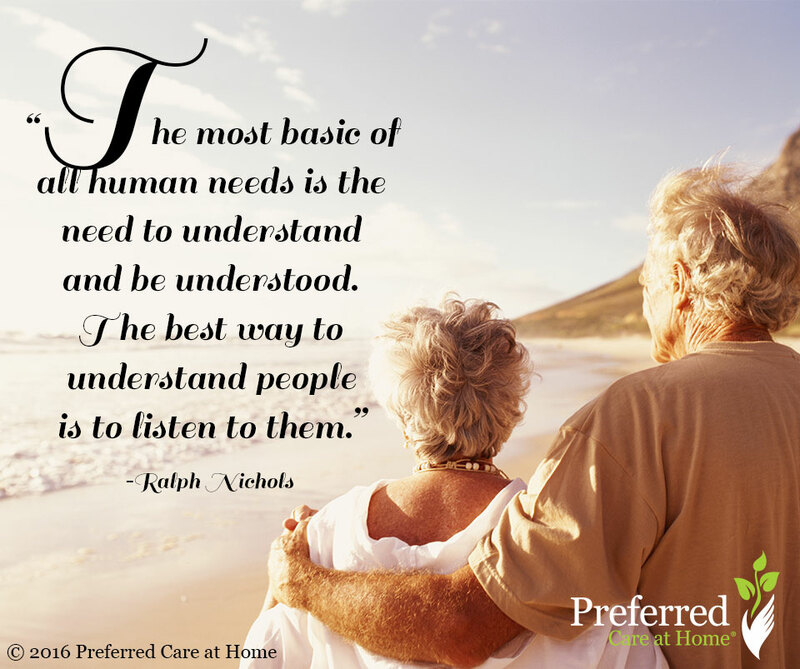 As family caregivers, there is always a list of unending tasks, but listening may require you to throw the list out the window and really focus on your senior loved one. 1. Make the Time. Sit down, but the phone away, and turn the TV off; dinner can wait and the floors can be swept later. Listening well starts with making the time to hear. 2. Notice Your Body Language. Turn toward the speaker and maintain eye contact. If you have turned off all possible distractions, having good body language begins to occur naturally with the desire to hear your loved one. 3. Ask Questions that Further and Clarify the Conversation. Asking questions is a great way to learn more about what your senior loved one is feeling. Be sure your questions are on topic and further the conversation not redirect it to another topic. Some examples include: “Tell me more about…” or “What do you mean by…” or “How do you feel about…” These are all examples of opened-ended questions that require your loved one to provide more information while furthering and deepening the conversation. 4. Avoid Judgement. Listening without judgement means you aren’t forming opinions or answers as your loved one is talking. If you feel judgement rising, further clarify the conversation by going back and asking more questions. 5. Allow the Conversation to have Impact. As you are talking with your senior loved one, you may begin to notice you feel sad, joyful, confused, to name a few emotions. Allow yourself to be impacted by your loved ones words and share that as well. A simple “That makes me feel sad, happy, excited, etc” reveals that not only are you listening, but that you care enough to be impacted.